The ISO standard “ISO9283: Manipulating industrial robots - Performance criteria and related test methods” describes tests to evaluate the performance of industrial robots. Among other things, it describes some procedures to properly measure robot position accuracy, repeatability as well as path accuracy. 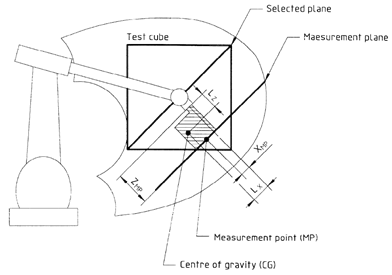 According to the ISO9283 norm, all the testing should be performed inside the so-called ISO test cube. The ISO test cube is supposed to be the largest cube that can fit inside the robot workspace. Furthermore, position accuracy and repeatability should be measured at five different configurations 30 times. It is well known that 5 configurations are not enough to provide an appropriate measurement of accuracy for modern robots. 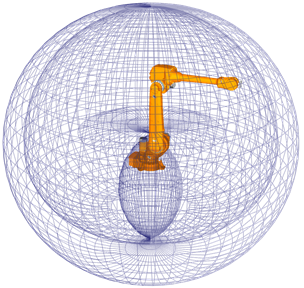 Most robot manufacturers only provide robot positional accuracy if the robot has been calibrated, furthermore, they use at least 100 different configurations to provide appropriate position accuracy statistics. Industrial robots are highly repeatable but not accurate; therefore, the accuracy of an industrial robot can be improved through calibration. However, the ISO9283 norm is often used for repeatability and path accuracy tests even if the robot has not been calibrated. It is recommended to watch the following video showing path accuracy tests with RoboDK: https://youtu.be/yMQjqAQY1iE. 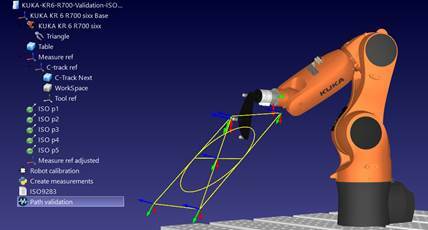 RoboDK can also be used to calibrate the robots as well as to test their performance before and after calibration. Finally, RoboDK can also be used to test the accuracy of the robot before and after calibration through ballbar testing. This will create the 5 targets described by the ISO norm as well as the path recommended for path accuracy testing. These targets and path remain inside a cube located in front of the robot. We can set the desired cube side as well as move the center (target “ISO p1”) and the reference joints that will define the orientation of the path. It is also possible to maximize the cube size to find the largest cube that fits in the robot workspace. A sample station with robot calibration and robot validation options is shown in the following picture. 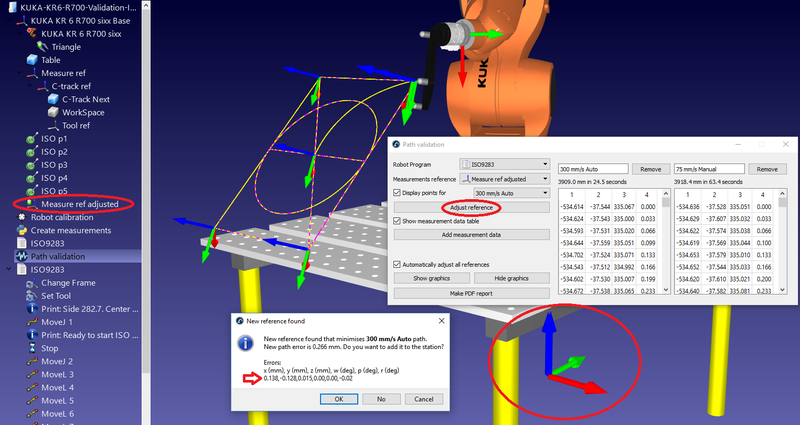 The same procedure that is used for position accuracy validation during robot calibration can also be used for position accuracy testing. Repeataiblity statistics can also be obtained if the measurements are taken sequentially through the same group of points. The only difference between performing only validation or calibration and validation is that the first option does not require a robot calibration license. These tests require identifying the robot base frame with respect to the measurements reference frame (base setup) and also the tool frame with respect to the robot flange (tool setup). It is possible to obtain a PDF report when the position accuracy and repeatability tests are completed. Generate program). 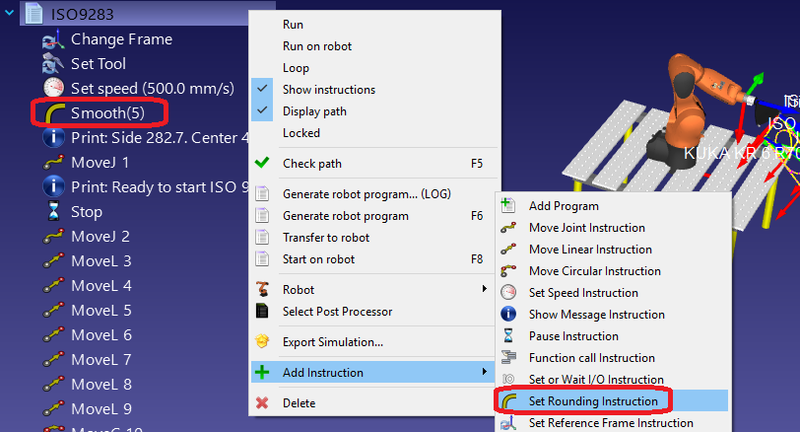 Alternatively, it is possible to use any other program created in RoboDK (such as a straight line, a circle or a square). It is also required to have a measurement system that can track the position of the end effector and provide the position measurements with respect to a reference frame. 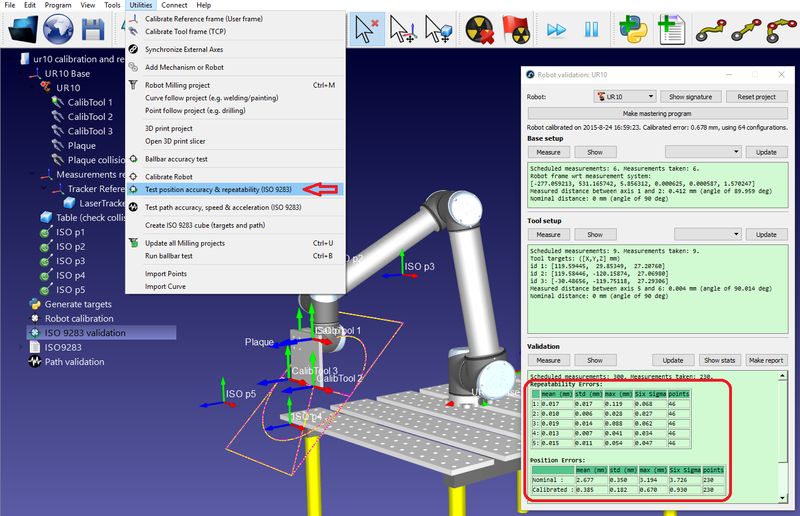 It is required to use the base setup and tool setup procedures in RoboDK (required to perform calibration or position accuracy tests) to identify the robot base frame and tool frame. The measurement data must be acquired while moving the robot along the program. The measurements should be recorded continuously, using the default software provided by the manufacturer of the measurement system. It is required to export the measurements as a CSV or TXT file. These files must contain XYZ position data as well as the time stamp for each measurement. Optionally, these measurements can contain the orientation of the tool with respect to the robot base. Note: It is recommended to take the measurements as fast as possible and without any type of filtering. 4. Import the measurement data by selecting Add measurement data. Alternatively, it is possible to drag & drop the CSV or TXT files containing the measurements to the Path validation window. Finally, select Make PDF report to generate a PDF with some statistics and graphics about the path accuracy, speed and acceleration. It is possible to run the same test more than once under different conditions (different speeds, different rounding/cornering values, different payloads, …) to compare these parameters in the same report. The measurement points can be displayed in violet. These measurements should match with the yellow path that describes the ideal path that the robot must follow. The statistics provided by RoboDK are the differences between these two paths. 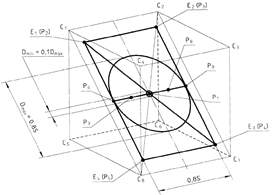 If the reference frame was not properly defined the measurement points do not match the yellow path. This can happen for several reasons, such as a bad reference frame definition or a different tool definition. In this case selecting Adjust reference will try to best fit the two paths so that the statistics provided isolate these misalignments. Once the path accuracy test is completed it is possible to obtain a PDF report by selecting Make PDF report, from the Path validation window. This will generate a PDF with some statistics and graphics about the path accuracy, speed and acceleration. In this example, both programs were generated using the Fine accuracy option. This means that the robot will stop at every point to make the path as accurate as possible. In this case, it is typical to observe high accelerations and decelerations along the path because the speed must be zero at the end of every line or circle movement (corners). Most robot brands offer rounding options to avoid this effect by smoothing the edges. 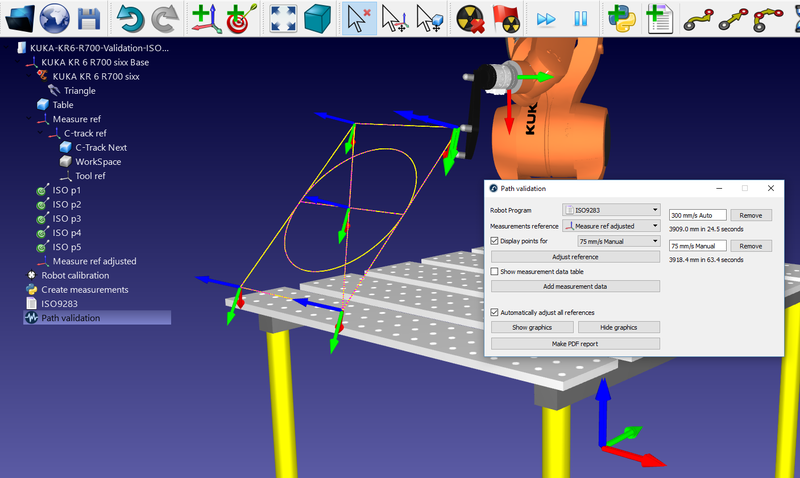 For example, ABB calls it ZoneData and allows specifying a zone of accuracy where the controller is allowed to smooth the edges, Fanuc calls it CNT and allows specifying a percentage of smoothing proportional to the speed, KUKA option offers the $ADVANCE instruction with the C_DIS flag and Universal Robots allows specifying a blend radius to smooth the edges). Therefore, the path accuracy test allows finding a good compromise between keeping a smooth speed while maintaining acceptable accuracy levels close to the path edges.